HR is a central pillar of every employer’s success, but many organizations struggle to leverage the full impact that Human Resources can have on their businesses. How can you demonstrate value as a strategic leader and increase C-suite support for your initiatives? Among changing workforce demographics, rising costs, and shifting employee priorities, HR’s role is more important than ever as employers look to remain adaptive and attractive. However, some HR and benefit leaders are still finding it difficult to gain a seat in the boardroom, limiting their potential influence and effectiveness. 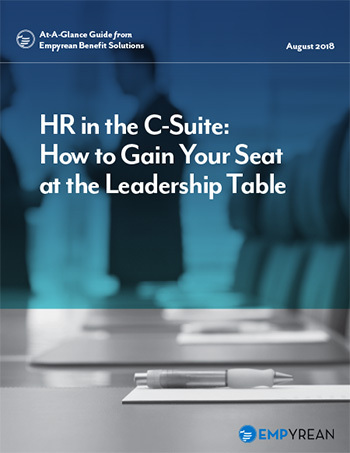 Empyrean’s new At-A-Glance Guide explores three ways you can gain a more prominent place at the leadership table, increase C-suite support, and maximize HR’s impact. This free guide provides actionable steps to help demonstrate HR‘s value and strengthen your role as a strategic business leader. Read on for a few quick talking points that will help you start a new HR conversation with your leadership team. How Does HR Impact Business Outcomes? In fact, employers that utilize a strategic benefits program focused on recruitment and retention are almost twice as likely to boast a more satisfied workforce and better company performance than those that do not.2 To show HR’s impact on your employer, remember that the topic of employee attraction and retention can pack the most punch. What Really Matters to Your Workforce? Employees by definition don’t work for free, so it’s no surprise that a raise may keep them around longer. However, benefits are the second-most critical element of an employee’s loyalty.3 Your benefits strategy says a lot about how your company cares for its workers, which can strongly impact how current employees and potential hires view and value you as an employer. Many different benefit options are available today, from various core coverage choices to relatively new options like student loan repayment, wellness programs, and pet insurance. The benefits you offer your employees must be relevant to their needs and concerns – and with up to five generations in the workforce,4 this isn’t always easy. Thankfully, understanding what’s important to your employees (and affecting productivity and employee satisfaction) is one of the key responsibilities held by HR. Staying on top of the latest benefit trends can help you keep a pulse on how other employers are approaching their benefits strategies. When in doubt, consider utilizing an anonymous online survey to find out what employees are really looking for when it comes to benefits. How Can Your Benefits Experience Keeps Employees Engaged? Your strategy doesn’t stop with your benefits package. Your benefits need a complementary benefits experience that can empower employees to learn about and confidently interact with your offering. A robust benefits administration partner can help build and tailor this experience to best serve your workforce, benefits strategy, and company culture. C-suite leaders may have difficulty understanding how different benefits enrollment and administration technology platforms will result in different results and ROI – and this can be especially true for those that are mostly focused on bottom-line costs. When considering potential benefits administration vendors, it’s important to remember that not all solutions are architected to the same standard of efficiency, data integrity, and adaptability. A system’s front-end must be intuitive and engaging, while its back-end processes must be scalable and accurate. In addition, your benefits administration technology must be able to adapt to changes in your strategy and offering, ensuring you remain adaptable as your employees’ needs evolve by supporting integrations with any plan or program offered by any carrier. This will help “future-proof” your service and keep your experience smooth and consistent. A smart benefits administration solution will do more than simply enable employees to enroll in coverage: it will serve as a one-stop-shop for year-round education and engagement, while also providing your team with the tools and data to gain insights and outline your success. Measurable outcomes are a crucial part of maintaining confidence within the C-suite. Your benefits administration partner should be dedicated to ensuring you achieve your goals, as well as provide you with the support to help highlight your team’s achievements. For more, download Empyrean’s new At-A-Glance Guide today. This guide provides tips to better position HR as a business leader and will help drive more positive outcomes as your strategy and workforce evolve. As you read, we’d love to get your thoughts. Feel free to contact us with questions or comments at info@goempyrean.com. “2018 Retention Report: Truth and Trends in Turnover.” Work Institute. Franklin, TN. May 2018. “2018 Employee Benefits: The Evolution of Benefits.” The Society for Human Resource Management. Alexandria, VA. June 2018. “2017 Aflac WorkForces Report: Employee Overview.” Aflac, Inc. Columbus, GA. February 2017. Moss, Desda. “5 Generations + 7 Values = Endless Opportunities.” Society for Human Resource Management. Alexandria, VA. June 20, 2017.